Recovery mode is , witht eh player turned off. Turn teh hold switch on, then, while plugging in the USB cable, hold the Menu (power on) button until the player shows up as 16mb format. I got curious today and decided to open up my v2. Unfortunately, I have no scanner and the only camera available was my mother's which has very poor macro-focus. My hands were shaky, but I did the best I could, taking multiple shots of everything that seemed worth noting. Anywhere text was printed, I took at least one picture. I also removed stickers from chip-sets so that the text could be read. I'm uploading as 121mb rar file to rapidshare and rarhost at the moment. Connection is slow, I'll post links in about a half hour. Hopefully somebody else will be able to host them somewhere better, or at least whatever ones are most useful. And yes, I know there are already images of one disassembled, I felt like doing this anyways. Alright, I hope some of you might find something useful in these. The latest firmware update for the e200 v2's puts MSC mode back into the sansa's. A recovery mode is pretty much the last thing we need before someone starts writing the first bootloader embryo to try on this target. So, does anyone have any new ideas for us v2 owners to try to get into recovery mode? I think it's pretty clear by now that if the v2s have one, it's quite a bit different from that of the v1s. I've tried a lot of combinations of buttons while connecting the cable with hold on (and off, too, for that matter) on my recently bought e280v2 without noticing anything. Is it guaranteed that a recovery mode would make itself known immediately (eg by presenting a new partition)? Might it be necessary to check with fdisk -l on every new try, or maybe check for new hidden files on the standard partition? First, it's quite possible that there is no user-accessible recovery mode. Then, if there is one it could be triggered by any imaginary means and there's no saying it needs to be anywhere similar to that of the v1. In fact, it could require the insertion of a hardware dongle attached to the accessory port, that the OF can detect, or some other means that is very, very, very unlikely to be stumbled upon. Could someone with a v2 (of any kind) please plug it in and run http://www.chiark.greenend.org.uk/~christi/misc/usbids.exe if on Windows, and lsusb if on Linux and paste the output here? In any or all of msc, mtp and rescue/manufacturer modes if available. Download my Rockbox stuff: Prebuilt Windows simulators, Fonts, and more! Really hope this can help you get somewhere! 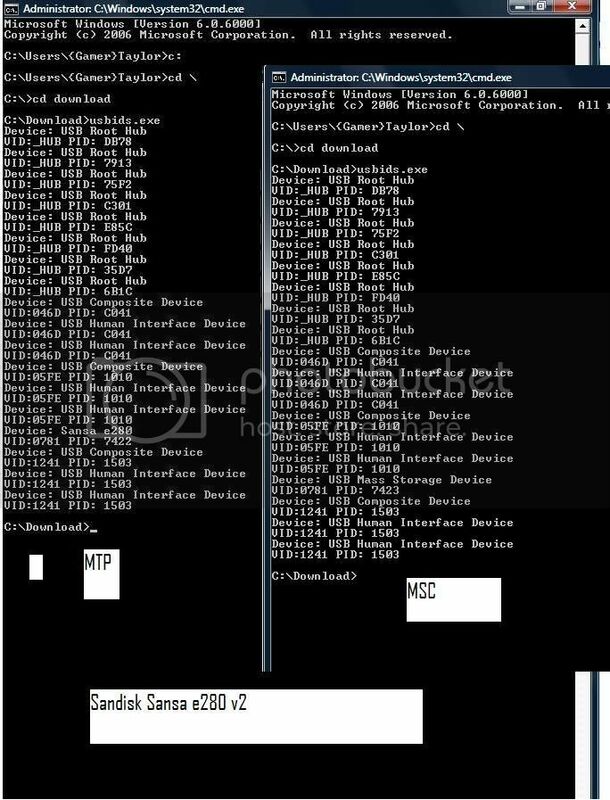 Bus 002 Device 073: ID 0781:7423 SanDisk Corp.
Â idVendorÂ Â Â Â Â Â 0x0781 SanDisk Corp. Bus 002 Device 075: ID 0781:7422 SanDisk Corp. Thanks a lot to both of you. Could anyone with a differently sized Sansa confirm that they get the same numbers (0781:7422 and 0781:7423)? This has been the case for all other Sansas so far, but you never know. sansa is a quite nice device but with a lack of functionality. tnx for your research and development work!